Why Are Sensors Important ? When you are considering purchasing a new android phone or tablet or using android for a particular task, then you will need to ensure that the device supports the required sensors. For example, if you are interested in using your smartphone or tablet for walking and hiking then it should have a magnetometer (compass Apps) and ideally GPS (location apps). Not all sensors are supported by all phones/tablets. Generally the more expensive devices offer more sensors. Here is a list of sensors and their common usage. Air humidity sensor– detects moisture and used in weather and fitness Apps. Barometer – Measure atmospheric pressure- used in weather Apps and navigation apps as it can detect hight above sea level. Camera – Besides being used for taking pictures it can also be used for motion detection in security Apps. Fingerprint sensor– Used mainly for security. G sensor or accelerometer -Measures change in velocity /motion. . On tablets and phones it’s main use is for detecting screen orientation and switching from landscape to portrait. GPS- Used for determining your exact location. Required if you want to use your tablet as a SatNav. Infrared or proximity sensor- Comprised of an infra red LED and an IR light detector. It is used normally to detect how near your face is to the phone/tablet. Used for measuring, and motion detection. It is also used for remote control on TVs- infraredblaster. Magnetometers – Measure earth’s magnetic field. Need if you want to use your device as a compass. Light sensor – Detects intensity of ambient light. microphone- sound sensor – Besides being used for normal phone usage or dictation it can also be used for detection in security Apps. Bluetooth – Data link protocol. Necessary if you want to use your phone/tablet in conjunction with a smart watch. See understanding Bluetooth and how smart watches work with tablets. Wi-Fi- A Data link protocol. Used for connecting you tablet/phone to the Internet. Standard on all tablets/phones but not on smart watches. NFC (Near Field Communication ) -A Data link protocol which requires devices to almost touch each other, and is used in applications like Google pay. Infra Red – Used for remote control (TV –infraredblaster.). Becoming popular again on phones. What Sensors Does Your Tablet/Smart Phone Have? 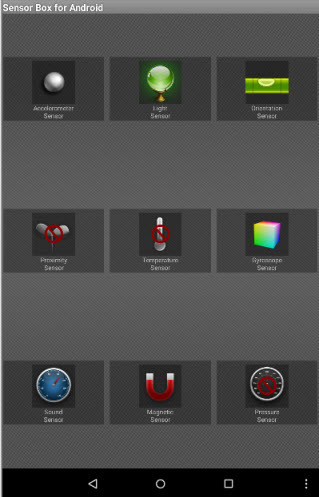 You can find a list of the sensors supported by your phone or tablet using an App like Android Sensor Box. Sensors built into external devices like a smart watch can also be integrated into Android tablets/phones. Sensor data and events are sent to Android using Bluetooth or Wi-Fi. This is likely to become a common way of integrating sensors into android Apps in the future. Android tablets and smart phones come with a number of inbuilt sensors. If you are purchasing a device for a specific application then ensure that it supports the required sensors.